VR: Virtual Reality Video: Has a Powerful New Film Just Pushed Into the Mainstream? It’s difficult to talk about virtual reality without sounding like I did when I was a kid the first time I watched a colour telly during the Moscow Olympics in 1980. It was round at a friend’s house during a birthday party and athletes from Europe and Africa in multi-coloured vests were sprinting around a burnt red track. We had been without a telly for two years and the images soaked into my television-starved mind. It would be another two before we did. So, to virtual reality – or VR. The technology isn’t new. It’s been around for several years but it’s starting to cut through to the mainstream. Steven Davies, who I’ve worked with in delivering video workshops gave me a spare pair of Google cardboard in the summer. This is a cardboard self-assembly kit that you fit your smartphone into before watching specially-shot 360 degree footage you can download from Google Play. He’s been experimenting with immersive video for years. I’m starting to think he’s onto something. There are VR downloads out there on Google Play. There are some amazing downloads to watch. But the download this week that really stopped me in my tracks has been the New York Times footage of three different children caught up in three different wars with the same unsettling outcome. I recommend you download it. The are talking of it as a new form of storytelling. I think they are right. 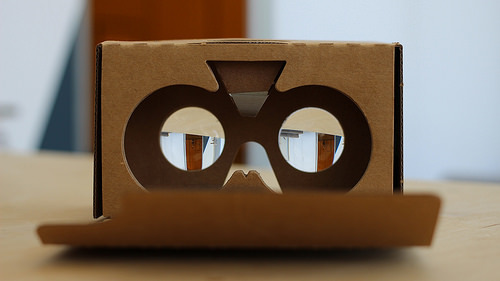 You can pick-up Google cardboard online to watch the film in its full glory. But you can also watch it in smartphone setting. Foreign news used to be a journalist being sent off to war zones to file a story through a distant telex machine. Photographers would try to capture an iconic image. Several days later you’d glance at it while eating your cornflakes. You may even read it. Then rolling news CNN-style pushed the boundary again bringing war zones into your living room. The New York Times VR download has changed that. It has taken you into the warzone itself. The New York Times download is an ambitious 10-minute film that cuts between three stories of two boys and a girl. There is no commentary. There is no editorial. There is just you. There is the child, their words and there is a bed of music. With VR you can look up, look down and look all around you. The film starts with you standing in a shattered room. You look down. You see shattered furniture, mess and torn books. Your eyes and your mind compute to tell you that you are in the room. You hear the scratching of chalk on a blackboard behind you. You turn around look up and you see a small boy with his back to you reaching up to write on the blackboard. You can’t believe a boy is standing in such a damaged room. It is eerily wrong. This is Oleg from the Ukraine. His words as a voiceover tell you his story. You read isolated sentences of his story that float in the air. He tells you he used to dream with his friends of planting a bomb in his school but he doesn’t now. When the war started he fled with his family, says. He tells you he returned to find his grandfather dead in the garden. He had died several months before and had lain unburied. Then you are in a canoe with a boy on his own. This is Chuol. You are in South Sudan. He had fled for the swamps with his grandmother but had lost his mother. He stands in front of you his eyes burning with pain and you look away. You look back and he is still there before you. You see a boy who life is kicking whose joy has gone. You hear the story of Syrian girl Hana too. She gets up with her family at 4am to pick cucumbers. You’ve heard stories like these before many times. But it’s unsettling to see them through VR with them standing in front of you. I showed the film to my own seven-year-old daughter and watched carefully. She looked filled with concern for the children she saw in front of her and she watched quietly. Afterwards, we talked about how lucky we are to live in a country where we didn’t have war. I showed the film to my wife. It didn’t have the immediacy of livestreaming, she said. It felt like a film too. She didn’t move around to explore the 360-degree nature. She just focussed on the child. But it reached out in a way that other journalism doesn’t, she said. You can download ‘The Displaced’ here.